I am sure your wondering who this is? This is my mum. 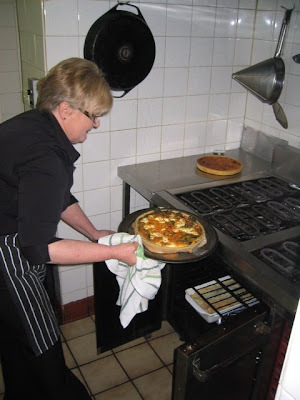 She is famous for her quiches among 100's of other dishes ranging from sticky date pudding to Morton Bay bugs- Oh how I long to sit on mum and dad's porch and eat chili bugs with a lovely drop of Tassie Riesling! My grandma was a baker, my mum is a chef and I guess it was more than likely my sister or I would walk in the same foot prints. I still remember mum flambe a dinner when I was very young- I was totally impressed she set our dinner on fire right before our eyes with a smile on her face. When we had picnics mum would always have wonderful food spilling out with the envy of our surrounding friends, we'd feast on her latest Thai chicken salad or beef satays. On camping trips we would always have a delicious curry to look forward to after putting up the tent and setting the fire. Now I have kids of my own I am so excited to give them a taste of the food experience I had growing up. I didn't realize how lucky I was to come home from school and feast on a plate of homemade nachos or date scones with lashings of cream- if we were really lucky and the customers didn't eat all the 'Death by Chocolate' then we were allow to devour the leftovers topped with vanilla ice-cream. Mum was always thinking of new ways to cook and buy 'exciting' ingredients to spice up the family meal. I am sure back then I made the same complaints the boys make 'What is this?' 'Why can't we have pasta like everyone else?' but years down the track I am really happy she followed her taste buds and always wanted to know more. I think the boys will be happy too, it might take a few years for them to realize( just like their mum) how cool it is to eat eggplant and couscous.